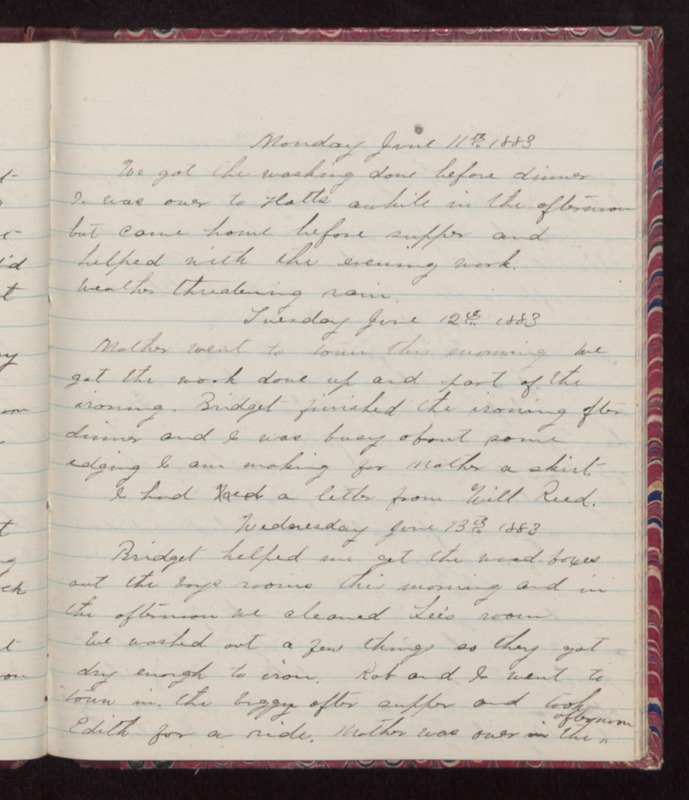 Monday June 11th 1883 We got the washing done before dinner I was over to Hatts awhile in the afternoon but came home before supper and helped with the evening work. Weather threatening rain. Tuesday June 12th 1883 Mother went to town this morning we got the work done up and part of the ironing. Bridget finished the ironing after dinner and I was busy about some edging I am making for Mother a skirt. I had Rced a letter from Will Reed. Wednesday June 13th 1883 Bridget helped me get the [wood?] boxes out the boys rooms this morning and in the afternoon we cleaned Lees room. We washed out a few things so they got dry enough to iron. Rob and I went to town in the buggy after supper and took Edith for a ride. Mother was over in the afternoon.